Subject: [fathers4justice] ATTORNEY GENERAL ATTACKS! Permission for the Attorney General to obtain and use within any committal proceedings a transcript of the hearing on 23 January 2003. I don't know why the Attorney General sat on his arse for 6 months before doing anything - could this be the beginning of the Establishment backlash against F4J, following on the successful close-down of the Principal Registry? Or was he too busy giving advice to the Government as to the legitimacy of killing children in Iraq? Extraordinary scenes took place at the Royal Courts of Justice on 23 January 2003 culminating in the Honourable Mr Justice Singer abusing a defenceless 10-year old boy in the passageway outside Court 32, aided and abetted by a CAFCASS Children & Family Reporter and two of Her Majesty's High Court Tipstaffs. Forhad Matin, born in March 1992, was terrified of going to his Mother's house where he had been regularly beaten and assaulted by her and her relatives, so when Mr Justice Singer made an Order that he go and stay with her he refused to obey it. This so incensed the Judge that he spent nearly half-an-hour outside his Courtroom trying to intimidate and threaten Forhad into submitting to his Order, finally reducing the child to tears. Try as he would, however, he was not able to break the will of this brave boy, and the Judge was forced to reconvene the hearing and rescind the Contact (access) Order he had made, so that Forhad was able to go home with his Father. In the public interest CONTACT brings you a full account of what took place that day. It's no exaggeration to call it child abuse: one of the nastiest things the Honourable High Court Judge said to Forhad was — "If you don't go with your Mum I'll put you in a place where you can't see your Mother or your Father — How do you like that?" — which Forhad understood to mean that the Judge was threatening to put him in a children's home. In one form or another the abuse of children who want to live with, or have a meaningful relationship with, their fathers is happening every day in the High Court Family Division and in County and Magistrates' Courts throughout the country. The malign ethos of the Family Division is still that children should be in the effective custody of their mothers not their fathers, and nothing infuriates the Judges more than the child who votes with his feet, repudiates the maternal Residence Order, and elects to live with his father. Child power is increasingly becoming the response to the stupidity and stubbornness of the Judiciary. There is no censorship in this story, of names or anything else. Censorship of any kind is against the editorial policy of CONTACT (see this Issue's Editorial). The Family Division uses censorship by injunction and contempt laws to suppress free debate about its wretched decisions and to hamstring effective campaigning by those who want to publicise injustice. If you did not know who Forhad Matin's Father was then you could not communicate with him and work with him to reform the law and the way the law is applied by the courts. Reciprocally, neither he nor others can communicate with and support you, the reader, in your own battles in the courts and campaign for change if you are forced to remain anonymous with your very name suppressed (because it is your child's name too and the child is not to be identified, according to the judges). That is exactly what the Judiciary and those who formulate family policy want — to stultify protest and stop men working together: it has nothing to do with protecting children. Abdul Matin has been battling in the courts for over 7 years to ensure he sees his children. 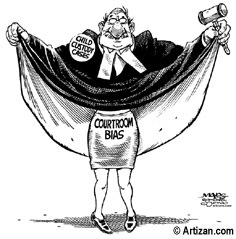 Originally in Edmonton County Court his case was transferred to the High Court in 1997: see the reported case Re Matin (Minors) (Contact: Supervision)  1FLR 721 CA where the Court of Appeal removed an absurd supervision order imposed by Judge Tibber at Edmonton. Forhad always wanted to see more of his Father to which his Mother Ruqia Ali reacted with harsh physical chastisement. On 26 November 2002 in the early hours of the morning Forhad was dragged out of bed by his maternal Aunt, one Nashima Ali Hipkiss, by profession a social worker, and Mother and Aunt held a kangaroo court for Forhad's crime of wanting to live with his Father. The Aunt brutally assaulted Forhad to punish him for this crime and knocked out one of his teeth. The Mother also threatened to kill Forhad if he did not live with her. Typically as happens in these cases the Police and Social Services were not interested when Abdul reported the matter — after all it wouldn't do to have a social work professional prosecuted for child cruelty and assaulting a child occasioning actual bodily harm. Forhad was again viciously beaten by his Mother on 27 December 2002 and then went for a holiday Contact stay with his Father until Sunday 5 January 2003. On return to his Mother's he ran away from her back to his Father who was waiting at the bus stop, and adamantly refused any more to stay with his Mother, albeit she had a Residence Order under the Children Act 1989. So Forhad went home with his Dad and has lived with him since. Ms Ali made attempts to enforce her Residence Order but failed because each time Forhad resolutely refused to go with any one sent to take him from his Father. On 16 January 2003 Mr Justice Hughes made a Recovery Order under s.34 Family Law Act 1986 and sent the Assistant High Court Tipstaff, Mr Philip Johnson, to Forhad's School to collect him and hand him over to his Mother. But Forhad refused to leave the safety of his Headteacher's Office and the Judge on hearing this declined to order the Tipstaff to physically carry Forhad away by force. So his Father was able to collect him and take him home from School. However, Mr Justice Hughes directed a further hearing on 23 January 2003, requiring Abdul Matin to attend with Forhad. You might think that the Court would have taken steps to protect Forhad and at least ordered (as Abdul requested) that he reside in the interim with his Father pending a full investigation of what he had been suffering with his Mother. That is not how the Family Division works. Mother custody is sacrosanct and has to be preserved at all costs, never mind if the child is tormented, injured or even killed in the process. Had it been the Father with the Residence Order ill-treating the child the Court would immediately have transferred Residence on hearing the Mother's plaint. All the Court did in Abdul Matin's case was to suspend his Contact Order and make a series of orders to enforce the Mother's Residence. The Father resisted none of these orders — every time it was Forhad who stood his ground and refused to leave his Dad. On 23 January 2003 Father and son duly attended Court 32 at the Royal Courts of Justice at 2 PM accompanied by Dr Michael J.Pelling as McKenzie Friend (also personal friend by now of Abdul and Forhad), and Mr Anthony Torrance (also legal adviser and family friend) & Mr Steve Stephenson (of Families Need Fathers). A CAFCASS Children & Family Reporter, Mrs Muriel Raleigh, was in attendance. In Court before Mr Justice Singer, Abdul Matin applied for his son to be seen personally by the Judge, which is what Forhad wanted: however the Judge ruled he would not see Forhad, who was to be interviewed by the Reporter. This was done and the Reporter then truthfully gave evidence. After hearing this sad and shocking account not even Singer J could insist that Forhad would reside with his Mother, but in typical Family Division manner refused to make an Interim Residence Order for the Father. Doing his best to salvage the mother custody default, and ignoring the very real dangers to Forhad and his manifest fear, the Learned Judge then ordered immediate (literally) Contact with the Mother at her home for 2 days to 25 January 2003. He ordered that the Father should immediately leave the Royal Courts of Justice and go home, though on protest this was changed to going down to the RCJ Great Hall and waiting there. The Judge's plan was to get the Father out of the way and by force somehow restore relations between Mother and son ("building bridges", he said). Too bad if Forhad got beaten to pulp or killed in the process. A more crass and stupid plan would be hard to imagine, but this is the English High Court Family Division. Had the sexes been reversed all Dad would have got would be supervised Contact in a Centre. The Judge directed the Reporter Mrs Raleigh to convey the news to Forhad, who was outside Court 32 in the passageway with Mr Torrance & Mr Stephenson. Despite the Judge's order that Abdul should leave, he stayed in Court 32 with Dr Pelling. After a while the latter became alarmed at what the Reporter might be telling Forhad, fearing that she would lie and say his Father had gone, so Forhad would think he had no option but to go with his Mother. This was exactly what the Reporter did. Dr Pelling went out and interrupted the Reporter to tell Forhad that he was not being told the truth, his Father was still there in the Courtroom, and if he did not go with his Mother then his Father would be able to take him home. The Reporter got cross at her lie being exposed, and her attempts to persuade Forhad to get up and go with his Mother failed. During these attempts the Reporter repeatedly pawed Forhad about and pulled him by the shoulder to force him to get up from where he was seated by his friend Mr Torrance. A while later the Judge himself came into the passageway, dressed in his overcoat and on his way out of the Royal Courts of Justice. By this time another Tipstaff was also on the scene, Mrs Susan Cheesley, the Acting Deputy Tipstaff, and she told the Judge the problem they were having in persuading Forhad to comply with his Order. Whereupon Mr Justice Singer wheeled round, went back down the passage and confronted Forhad. There then ensued the remarkable spectacle of a High Court Judge (in contravention of his own judicial decision) haranguing threatening intimidating and humiliating the 10-year old boy Forhad for half-an-hour in an ultimately vain attempt to bully the frightened child into going home with his Mother. Forhad bravely resisted but at the end was reduced to tears and held his head in his hands in miserable despair. When Forhad begged for his Dad to be with him, the heartless Judge said, "No, you don't need your Dad with you". When Mr Justice Singer saw he was not getting his own way with Forhad, he resorted to crude threats, abusing his authority as a High Court Judge to say for example, "If you don't go with your Mum I'll put you in a place where you can't see your Mother or your Father — How do you like that?" — which terrified Forhad into thinking the Judge would put him in a children's home. Eventually even Mr Justice Singer had to give up, and he reconvened the case in Court 32, immediately rescinding his earlier Contact Order. While the parties went back into the Courtroom Dr Pelling took the opportunity to sit beside and comfort the distressed Forhad, whereupon the Assistant Tipstaff told him not to talk to Forhad and assaulted Dr Pelling by grabbing him to pull him away from Forhad. Dr Pelling then returned to Court 32 as McKenzie Friend and Mr Justice Singer informed him that he was going to take steps to have a summons issued on him for criminal contempt of court. However, Dr Pelling is disappointed to have heard nothing further on that score. Then the Judge ordered that Dr Pelling should not continue any more in the case as Mr Matin's McKenzie Friend and so he left Court 32 and went out to tell Forhad the good news of his victory. Whereupon the Assistant Tipstaff again intervened in a threatening manner and Dr Pelling had to take Forhad down the other end of the passage and tell the Tipstaff to keep out, warning him that he now faced legal proceedings. The hearing concluded shortly after; Forhad continued to live with his Father despite the Mother retaining Residence. On 31 March 2003 Mr Justice Johnson adjourned Abdul Matin's applications for a Residence Order for Forhad and a Shared Residence Order for Forhad's sister Forida (born 1990) who wants to live with both her parents. We hope that at the final hearing on 29 April 2003 the 8 year saga that Abdul Matin and his children have suffered within the English Family law jurisdiction will conclude and that Johnson J [the most hated Judge in the Family Division whose erratic judgments are a by-word and who only escaped compulsory retirement on 9 February 2003 on reaching 70 because he was appointed before the amendment to s.11(2) Supreme Court Act 1981] will for once show a little wisdom and compassion and make the right orders. It will not, however, be the end of the saga so far as the general civil law is concerned. Because Mr Justice Singer was not acting in a judicial capacity when he tormented Forhad in the passageway outside his Court, and indeed was on his way out of the RCJ and acting in contravention of his own Order that he would not interview the child, it is believed that he has no judicial immunity from suit. Of course, the Reporter Mrs Raleigh and the Tipstaffs Johnson and Cheesley have no immunity anyway. So Forhad on 28 March 2003, suing by his Father as litigation friend, issued a Claim in the High Court Queen's Bench Division (No.HQ03X01005) seeking damages in excess of —15000 plus aggravated and exemplary damages for all that he suffered at the hands of these four persons on 23 January 2003. He is suing in tort for common law harassment threatening health and safety, statutory harassment (the 1997 Act), intimidation, and trespass to the person, and for human rights violations under the Human Rights Act 1998. The latter are for inhuman and degrading treatment contrary to Article 3 of the Convention on Human Rights (this Article is absolute), and for violations of the right to respect for private and family life under Article 8(1). He is further suing all defendants for misfeasance in public office. The day the Claim was issued Senior Master Turner immediately ordered it be not served and be struck out, an obviously craven act designed to thwart justice being done against the High Court worthies who have persecuted Forhad. This decision is now under appeal. Because the Assistant Tipstaff Philip Johnson interfered without lawful authority and assaulted Dr Pelling when he sought to comfort and talk with Forhad, Dr Pelling on 6 March 2003 also issued a Claim in the High Court QBD (No.HQ03X00730) for damages in excess of —15000 plus aggravated and exemplary damages, suing for trespass to the person, misfeasance in public office, and for violation of the right to respect for private life under Article 8(1) of the Convention. The day after the Claim was issued one Master Foster made an own motion Order that no person be permitted to examine the Particulars of Claim without Leave of a Judge or Master — normally the public have a right to inspect the Claim and take a copy, on payment of the prescribed fee: Civil Procedure Rules 1998 r.5.4(2). Since the Learned Master's Order only applies to the Court File, Dr Pelling is happy to provide anyone interested with a copy of his Claim — and you can also obtain it by emailing a request to paulmw@ji-net.com. Update 2004 04 04: Dr. Pelling goes to court Apr. 6, 2004 to fight for his freedom. The UK AG intends to have him put away and out of the way.